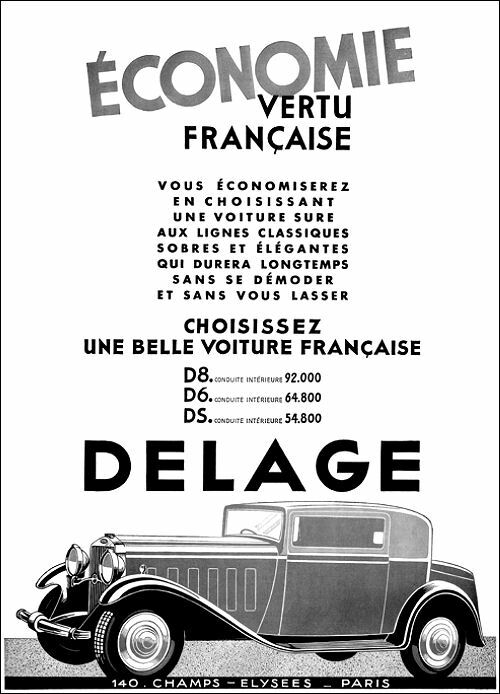 One of the sensations of the Paris Salon, the two litre Delage, bristles with new features. As regards the engine, the overhead valves are push-rod operated, but the closing springs are mounted alongside them and their pressure is communicated to the valve stems through forked levers. This design is claimed to lessen valve spring breakages and to minimise noise at high speeds. A single Banquard carburettor feeds the six-cylinder engine which is in unit with a four-speed silent third gearbox. Independent springing is adopted for each front wheel, the steering pivot being carried by two parallel V shaped pressings, the apices being connected to the steering head, and other four points hinging on the chassis. A transverse laminated front spring is used, fixed in the middle and linked at each end to the respective steering head assembly. The brakes are operated by armoured cables. The chassis has been still further lowered. The price either for the familiar low-built Delage Saloon or for an open two-seater of sweeping lines is £675. GP du Matin (Dieppe) No. 1, Lord Howe, Delage 1,500 c.c. 286.9 miles. 70.18 m.p.h., 5th, 2nd in 2-litre class. Earl Howe in British Empire Trophy. 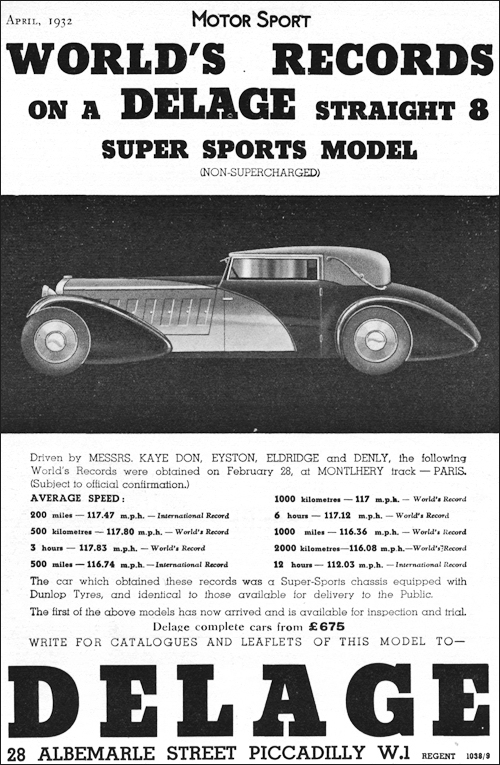 ON February 28th the famous French track was the scene of a combined AngloFrench triumph, when a straight-8 Delage sports model, stripped and fitted with a streamlined body, but otherwise in practically normal trim, not only broke records in its class but also accounted for six World's records. When a chassis which is available to the public proves itself capable of such a performance, it speaks volumes for the design and quality of the make in question. 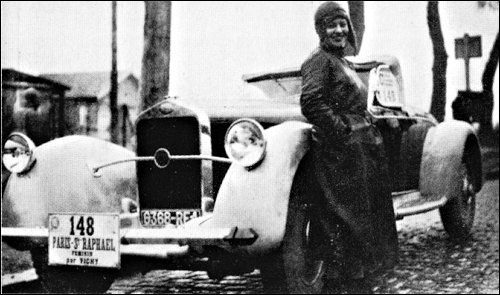 Delage speed is no special mystery to followers of motor racing, who will all remember the way the 1½ litre Delage racing team, in the hands of Benoist, Divo, Senechal, Wagner, Bourlier, Dubonnet, and others, swept the board in the years when the Grand Prix were confined to this size, and the lessons learnt in this intensive school have proved invaluable in developing the standard production which has so distinguished itself. In this case the team of drivers was English, being Kaye Don, Eyston, Eldridge and Denby, who put up a wonderful show under extremely uncomfortable conditions. The biting cold was their greatest handicap, and the physical endurance required to keep going in relays for twelve hours can only be imagined. Kaye Don was actually confined to bed with a temperature, but when preparations were complete for the record, he defied all orders to the contrary and immediately flew over to Le Bourget and reported for duty. Talking to him about the record on his return he spoke as if it was all simple, but when one realises the difficulty of maintaining some 120 m.p.h. all day in a temperature below freezing, it is easy to see that it was actually very different. Fortunately he appeared none the worse for his disregard of medical advice, so we presume that fresh air is good for 'flu! The actual World's records taken were 500 kilometres, 3 hours, 1,000 kilometres, 6 hours, 1,000 miles and 2,000 kilometres, the speeds being 117.8 m.p.h., 117.83 m.p.h., 117.0 m.p.h., 117.12 m.p.h., 116.36 m.p.h. and 116.08 m.p.h. In addition to the above World's records, class records were taken, being the 200 miles at 117.47 m.p.h., 500 miles at 116.74 m.p.h. and 12 hours at 112.03 m.p.h. Dunlop tyres also took their indispensable share in the British side of the achievement; we heartily congratulate all concerned on the results. Two of these records, the 500 kilometres and the 3 hours, were later beaten by Divo and Chiron on a 2,300 c.c. supercharged Bugatti , but we may take it that the game has only just started, and there will be plenty more record activity on the part of both concerns before long. The Delage at Montlhery (Eyston up) with Divo standing alongside. Everyone will be sorry to hear that the name of Delage will not appear in the entry lists for Grand Prix races in 1933 after all. There is every reason to hope, however, that Louis Delage will build a team of cars for the 1934 season, and we can rest assured that the machines, when they appear, will be of such quality as to challenge the rest of the world.